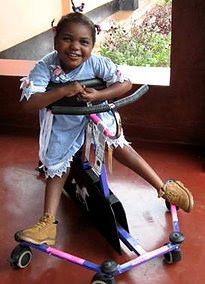 Tapiwa Maxwell, one of our children in full-time care in Malawi, is the beneficiary of a standing frame donated by The Mobility Project located in Bremerton, Washington. When five-year-old Tapiwa came to COTN in 2003, she had suffered many traumas and difficulties including hypoxic brain injury, malnourishment, and physical abuse. She also has cerebral palsy, a neurological condition that causes physical disability, permanently affecting body movement and muscle coordination. These contributing factors led to her inability to walk, talk, feed herself, or perform other basic life activities. Since coming to live at Chitipi Farm in Malawi, Tapiwa’s quality of life has improved significantly. She is now responsive to sound, recognizes her name, laughs, and enjoys the company of the other children in the Chitipi home. Last fall, Courtney Schmidt, a COTN associate serving in Malawi, submitted a proposal requesting specialized medical services for Tapiwa. As part of an overall plan to give Tapiwa the best continued care possible, she requested a standing frame. A standing frame helps the person utilizing it to remain in a standing position, which provides an alternative to sitting. This frame, when used in combination with leg casts and physical, occupational, and sensory therapy would help Tapiwa become more mobile. Dave Schertzer, COTN–USA Resource Director, received the request and prayed. He remembered a previous donation COTN received from The Mobility Project, a nonprofit organization that provides basic equipment, such as wheelchairs and other mobility aids, to disabled people living in poverty throughout the developing world. After contacting Lisa Murphy, President of The Mobility Project, Dave was excited to learn the good news— a standing frame had recently been given to The Mobility Project and was available for Tapiwa! Dave was even more encouraged when he learned that The Mobility Project rarely receives donated standing frames. To purchase one new, the estimated cost is between $1,000 and $3,000. “I am consistently amazed how God already knows the request before we receive it and He gets the glory for connecting the dots, and connecting The Mobility Project to Tapiwa and Malawi,” said Dave Schertzer. The walking frame arrived in Malawi in March, and Tapiwa has already begun to use it. “This apparatus will enable Tapiwa to strengthen her muscles and develop her standing and walking skills to become more productive in the kingdom of our Lord,” said Yobbe Lungu, COTN¬–Malawi Country Director. During a recent trip to the USA last month, Mr. Lungu was able to present Lisa Murphy, president of The Mobility Project, with a certificate of appreciation. For more information on The Mobility Project, visit their website at www.mobilityproject.org.